Are you looking for the next big thing in crypto? Then you need to pay attention to XinFin. This is not just another crypto in an already crowded cryptocurrency market! It’s a blockchain project that has everything investors are craving for, but can’t get in many existing cryptos projects. But it’s not just on transaction speeds that XinFin dwarfs the rest, it is also way better on transaction costs. Transaction costs are part of the reasons why some cryptos like Bitcoin have a mass adoption problem. Solutions like the lightning network are good, but can lead to centralization defeating the whole essence of blockchain technology. XinFin (XDC) in its design is made to have some of the lowest transaction costs in the market, and that’s a good thing for its mass adoption as a payment method. XinFin also makes use of the prove-of-stake mining algorithm. If you have been into crypto then you know that Ethereum, the second largest crypto by market cap aims to transition to the prove-of-stake system. The reason being that prove-of-stake cuts on transaction costs, and helps improve on scalability. XinFin already runs on prove-of-stake, which makes it one of the most scalable blockchain projects in the market. 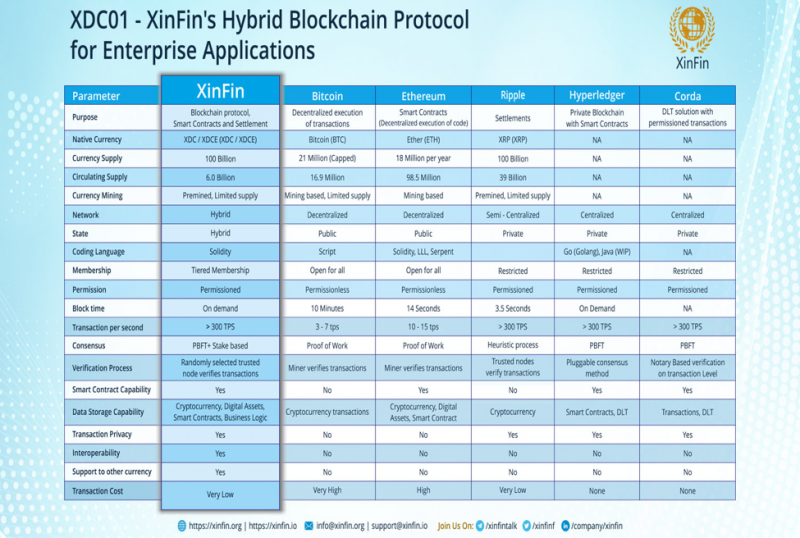 Considering that XinFin is focused on the enterprise market where scalability is essential, it then follows that the intrinsic value of this coin is way higher than most of what is currently available. That’s a good indicator to its long-term growth. But the greatest aspect of this crypto is that it is a hybrid blockchain. One of the problems of public blockchains is that transactions are verified publicly and the transacting parties are visible to everyone. This to large extent puts-off corporations from using these blockchains for privacy reasons. That’s where hybrid blockchain networks come in. Hybrid blockchains allow anyone to view transactions, but they can’t see the transacting parties. This makes such a blockchain the best bet for adoption by corporations that require data privacy for commercial reasons. That’s why XinFin, which makes use of the hybrid blockchain network is poised for major adoption by global corporations. Signs of this happening are already there, with Ramco systems already signed up to the XinFin blockchain. With such a fundamental strength, it is clear that XinFin is a crypto on the move, one that could outperform the market in 2018 and beyond. This is one crypto I am HODLing all through the year.